Braving the high-end, too-good-for-our-sorts designer label playground that is The Landmark in our quest for good cake, we quickly opted for the High Tea Set For Two ($315). We didn’t really pay much attention to the description, instead being won over by the pretty pictures, and so our meal mainly consisted of eating first and trying to identify the tastes later! 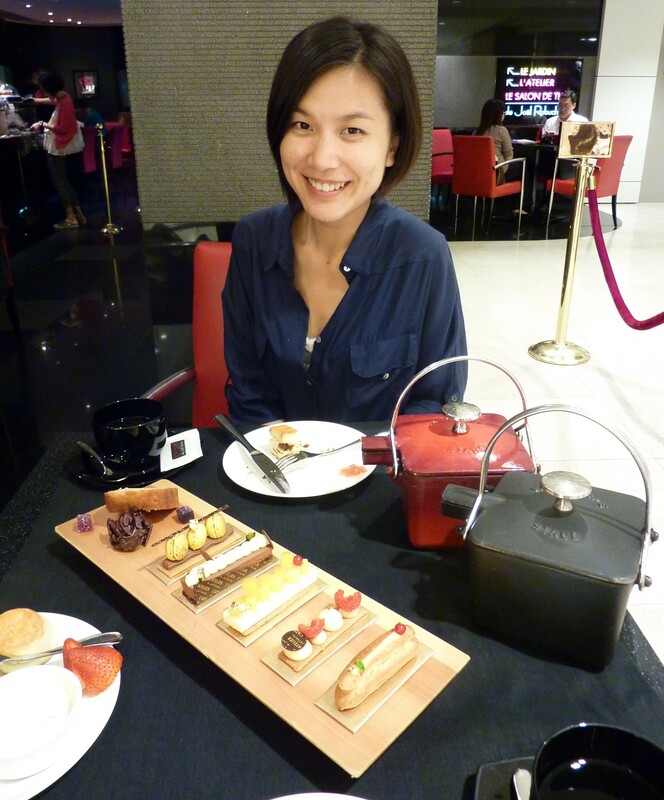 Even though the menu made the tea set look sizeable, all the pictures were printed practically to scale! They were all rather miniature, though definitely more of the ‘small and perfectly formed’ rather than ‘stingy Masterchef-y nonsense’ variety. First up, the savouries. These were utterly delicious and we both wished there were more, as the sweet side rather overbalanced this tea set. 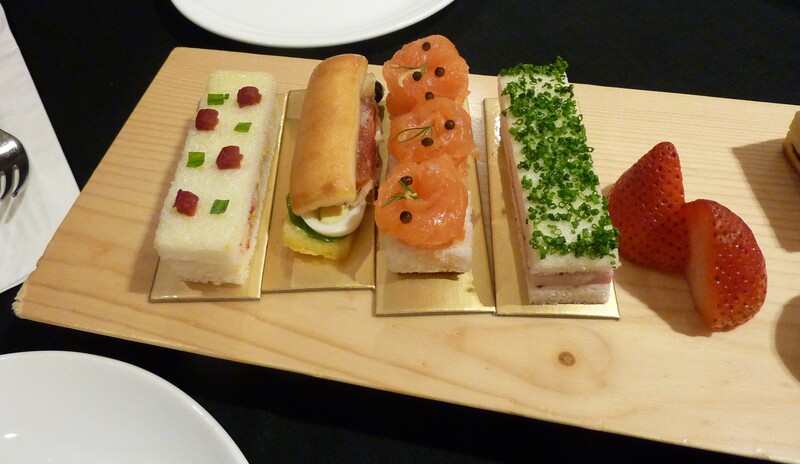 Belated online consultation of the menu tells me this consisted of the following sandwiches (left to right): lobster flavoured with tarragon, tuna and poached egg, Norwegian smoked salmon and caviar and premium ham and mustard seed. Our universal favourite was the salmon, which was soft, smoky melt-in-mouth deliciousness, even if there was too little caviar to make any difference. The filling of the lobster one was lovely (but we hated the intense sharp sweetness of whatever those little red cubes were on the top), the tuna was pleasantly un-fishy though the egg pieces felt a little cumbersome for such a dinky morsel and the ham was blandly unmemorable but probably the best a ham sandwich could be. All-round, the bread was delightfully light, fresh and made swallowing these whole an easy and all-too-enticing prospect! The scones were also great. Served with PROPER Devonshire clotted cream (not the nasty straight-out-of-a-can stuff many places here serve), these were warm, heavy, buttery globes straight out a (posh) English teashop. The real star was the homemade strawberry jam, which despite looking initially thin and watery, was actually wonderful. Just the right amount of sweetness, neither too tart nor too sugary, with lashings of luscious homely fruitiness. 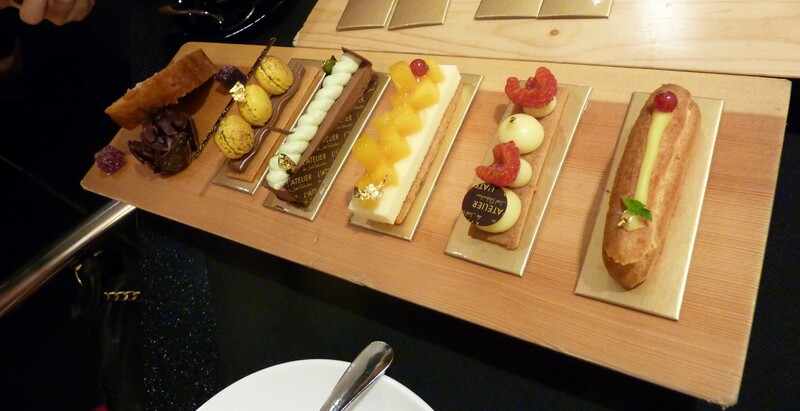 Finally, the pastries, which were almost too delicately artistically pretty to eat! Alas, consulting the menu online hasn’t really helped me to decide which sweet was which! Apparently there was a Paris-brest, L’exotique, Mont Blanc, macaroon ganache and blueberry cheesecake; well, I don’t even know what three of those things are (don’t Mont Blanc make pens?!) and there’s clearly no blueberry going on in my photo! Let’s start with the obvious – the macaron ganache (far left). The most visually stunning – and the most difficult to divvy up! The macarons themselves were light sweet confections of airy nothingness, as the best macarons are, and they were given a hit of rich creamy chocolate thanks to the ganache. As a high tea pastry, it was pretty perfect. Second from the left is what I think may be the Mont Blanc, which Wikipedia tells me is a dessert of chestnut and whipped cream. For me, the cream topping and mousse base was just too much of one texture – super soft, super creamy and way too rich for my palette. In the middle is what I reckon was a mango cheesecake. That sounds so ordinary, yet this was a whole different level of mango cheesecake! I found it utterly more-ishly wonderful. The cheese part was blended just right to be such a wonderfully creamy, non-heavy, non-lumpy consistency that it just slunk down my throat with a seductive sweet shiver. The mango was fresh, fruity, juicy and exuberant, the perfect counterpoint to the cheese. We just wished the base had been a bit more crumbly and biscuity, in the traditional cheesecake way, but the whole thing was feather-light enough to not register you’d swallowed anything at all! Second from the right and here’s where I start losing my way. I reckon this might be L’exotique, with Wikipedia coming to the rescue to say it’s a pastry of white chocolate and passion fruit (no mention of raspberries though!). I distinctly remember tasting pineapple at some stage… and I guess my mistaken pineapple could easily be passion fruit… so L’exotique it is! Honestly, this was a bit nothing-y – just small squidges of some chocolatey creamy fruity substance on a fairly flavourless cardboard pastry bottom. It looks better than it tasted. Finally, on the far right, is what I’m guessing is the Paris-brest – a choux pastry with praline-flavoured cream (thanks again Wikipedia!) – and also not a favourite at our table. Although the dessert itself gave me profiterole vibes in its composition, it simply wasn’t as tasty as one. The choux pastry was dry, bland and there was far too much of it, compared with the filling, which I can’t even remember. On the extreme left are the Petit-fours… basically yet more sweets. These were bigger and more filling than most of the pastries proper! There was a slice of banana cake/bread, which you’ll either love or loathe depending on quite how much you like banana. My friend Mirander is a banana fiend and was all over this; I’m not such a fan and found it’s full-on BANANA-ness and intense sticky moistness a bit much. Even after one bite, I felt full! (Incidentally, I love the banana bread at Applegreen, which Mirander hates because it’s too dry and not banana-y enough, telling you everything you need to about our banana scale, so you can see who you side with!). There was also a dark-chocolate covered nut stack and some tiny blackberry pastilles. The former was extremely gorgeous – I’m a sucker for chocolate covered nuts (keep your dirty jokes to yourself thanks!) and the pastilles packed way more tangy intensity than we could ever expected from such a little cube! Imagine a whole pack of blackberry Fruitips (Fruit Pastilles to British readers) distilled into one miniature square and you’re almost there. All in all, I could have done with the Petit-fours counting towards the sweet portion, sparing us a few of the less memorable pastries and giving us an extra sandwich for good luck! 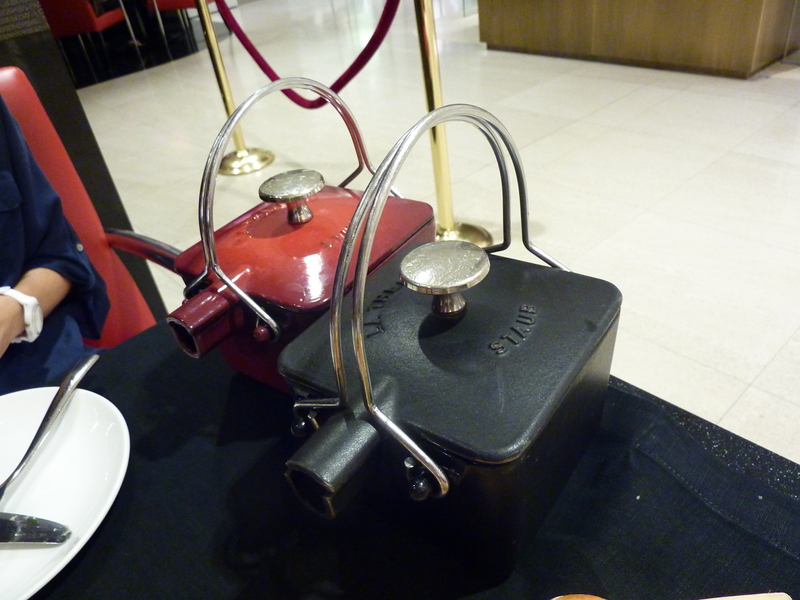 Tea was served in chunky metal super-stylish Chinoiserie-inspired pots, which totally fitted into the restaurant’s red-and-black décor but were a heavy pain to lift! Note to anyone picking the orange tea: don’t bother. The free glasses of water which had a lemon swirled around in them had more of a citrus taste! A final word on the place itself. The restaurant, L’Atelier de Joel Robuchon, is upstairs and continues the red and black theme, but to Edgar Allan Poe levels of Gothic intent. You have to go there to use the washrooms and, in the middle of the afternoon, it’s eerily quiet, creepy and deserted – and that’s before a door springs open soundlessly and automatically with no warning! I was searching for a headless horseman of a doorman (thankfully to no avail!) but luckily, Le Salon is open-plan in the mall itself, so has a much lighter and less oppressive feel! 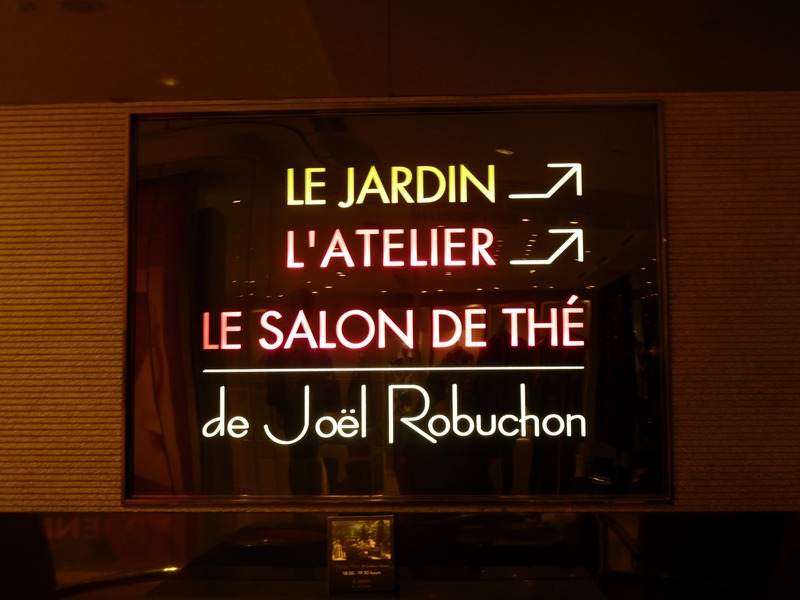 Overall, Le Salon de Thé de Joël Robuchon delivers a premium high tea experience that looks fabulous on photos and is almost as fabulous to the taste. 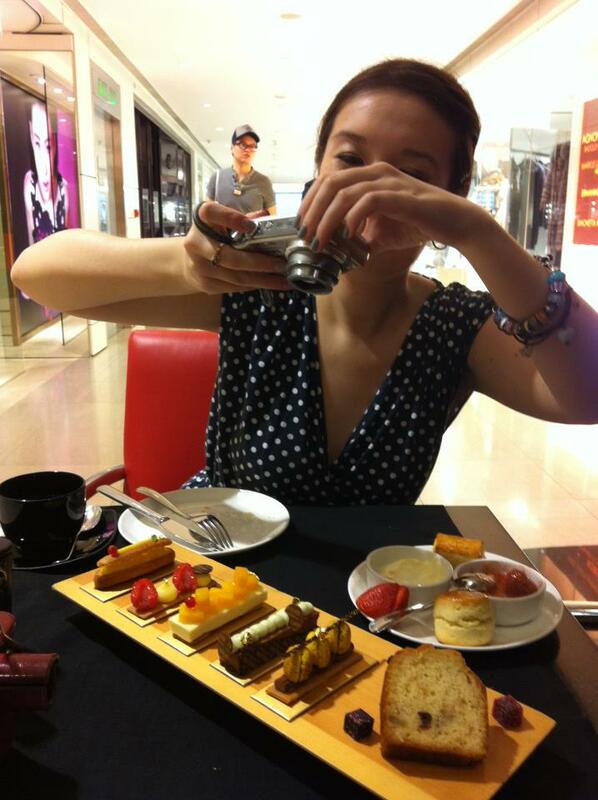 Saying that, I not sure I would go for the tea set again (though I’ve heard good stuff about the sandwiches), simply because there is such an ocean of other high-end high teas to sample in Hong Kong and although this was great, I’m sure it wasn’t THE best. Suggestions in the comments box please! UPDATE: I have actually been for this tea set again… sampling various rubbish high-end afternoon teas made me think this was actually pretty decent after all, and the items do rotate on a regular basis. Definitely still not the best in town though! This entry was posted in Food, Hong Kong and tagged afternoon tea, afternoon tea Central, afternoon tea Elements, afternoon tea hong kong, afternoon tea Kowloon, afternoon tea set, best afternoon tea Central, best afternoon tea hk, best afternoon tea hong kong, best dessert hong kong, café, cakes, Central, dessert, dessert hong kong, desserts, fine dining, French cuisine, high tea, high tea Central, high tea Elements, high tea hong kong, high tea Kowloon, HK, Hong Kong, IFC, Joel Robuchon, Le Salon de Thé de Joël Robuchon, restaurant, The Landmark. Bookmark the permalink. this looks so great! 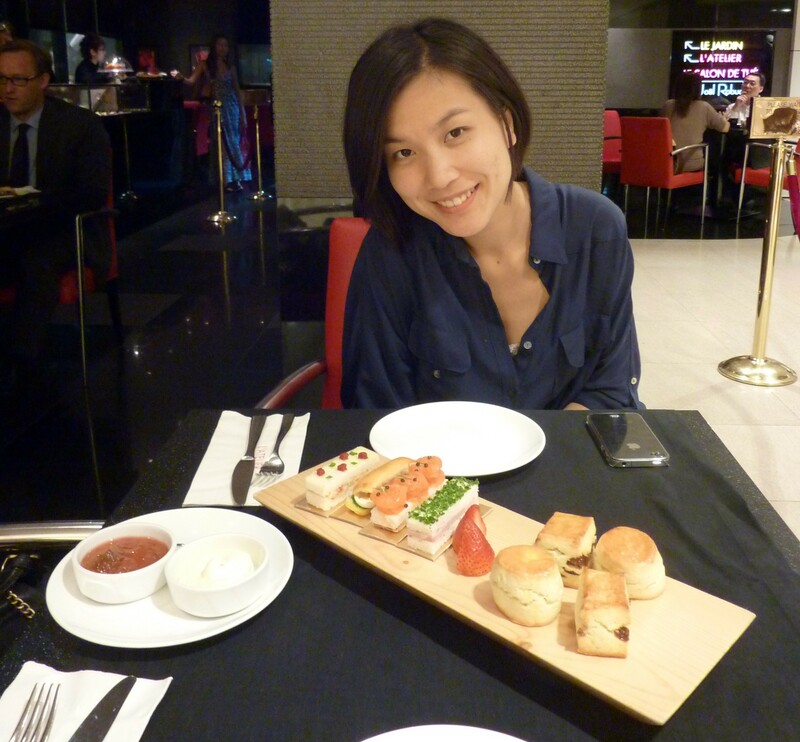 i can’t wait to return to HK for high tea! I think you could have high tea here every day and still not cover 10% of the number on offer! I’m sure you’d have fun trying though! i hope you find time to visit Domani thought. It’s fantastic. I’ll definitely be there in Dec when I visit! will be sure to try calamari at grappa’s too! The tea-set actually looks quite good! is it $315 for two or per person? 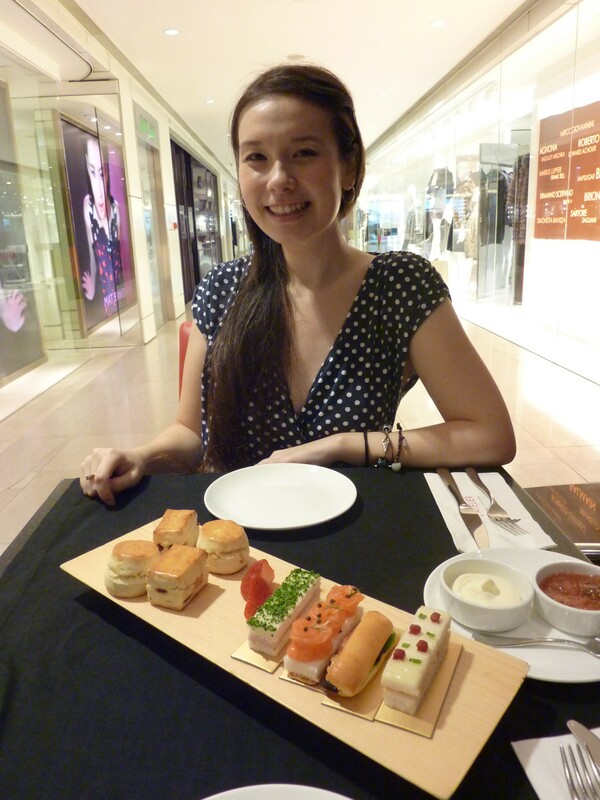 I never had high tea there before, but have had dinner there once, it’s definitely an amazing meal! Hey – yeah it’s $315 for 2 people! No salted caramel tart sadly 😦 maybe (hopefully?!) they change their pastries high tea line-up from time to time? Either way, your description’s got me drooling – I love salted caramel too! – so I’ll have to check that out some time separately! My bf took me there for my bday last month, and we did the degustation menu. By the time we finished we could hardly walk out of the restaurant because we were sooo full! (it was an 8 course tasting menu). Wow that sounds amazing! I’m always worried I won’t be able to manage so many courses, your description sounds fab. Hope you like the high tea! Next trip, you will definitely have to! 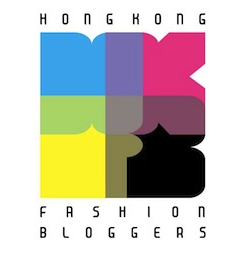 There are so many in HK, you’ll be spoilt for choice!